Christians in Context: from orthodoxy to orthopraxy. : Does Jesus Cleanse the Temple? This week I'm preaching on Matthew 21:12-17. The passage is familiar to us all as Jesus goes into the temple and turns over the tables of the money changers. This question dawned on me: Does Jesus cleanse the temple? I don't mean to question the historicity of the act, rather the nature of what Jesus did. 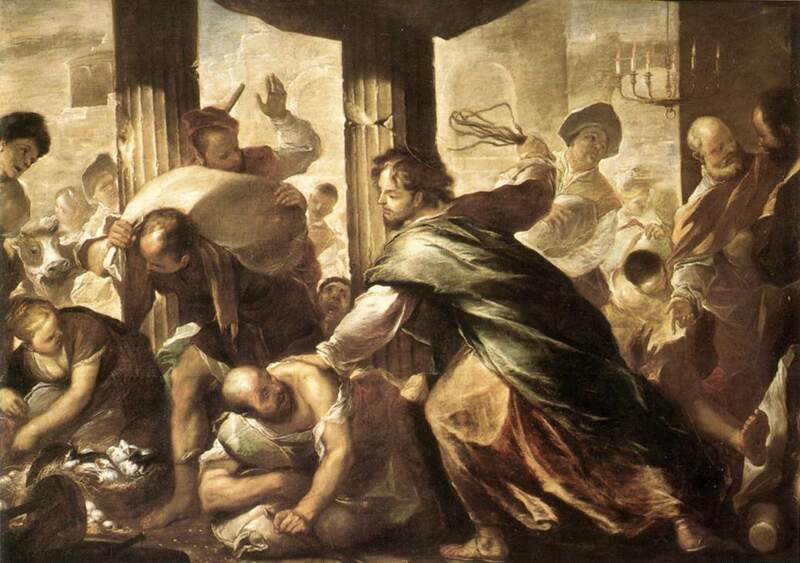 (1) 'Cleansing the temple' implies that there was a minor problem with the temple and that all Jesus had to do was get rid of the greedy people abusing the temple. But notice that in Matthew, Jesus' justification for his actions is a quote from Isaiah 56:7 and Jeremiah 7:11. As a good rule of thumb, whenever the Old Testament is quoted you should always look at the context of the Old Testament. 10 His watchmen are blind, All of them know nothing. All of them are mute dogs unable to bark, Dreamers lying down, who love to slumber; 11 And the dogs are greedy, they are not satisfied. And they are shepherds who have no understanding; They have all turned to their own way, Each one to his unjust gain, to the last one. Jeremiah 7:9 “Will you steal, murder, and commit adultery and swear falsely, and offer sacrifices to Baal and walk after other gods that you have not known, 10 then come and stand before Me in this house, which is called by My name, and say, ‘We are delivered!’—that you may do all these abominations? 11“Has this house, which is called by My name, become a den of robbers in your sight? Behold, I, even I, have seen it,” declares the LORD. 12 “But go now to My place which was in Shiloh, where I made My name dwell at the first, and see what I did to it because of the wickedness of My people Israel. 13 “And now, because you have done all these things,” declares the LORD, “and I spoke to you, rising up early and speaking, but you did not hear, and I called you but you did not answer, 14 therefore, I will do to the house which is called by My name, in which you trust, and to the place which I gave you and your fathers, as I did to Shiloh. 15“I will cast you out of My sight, as I have cast out all your brothers, all the offspring of Ephraim. These two passages juxtapose two themes: (1) The LORD returning to His people to bring them grace and mercy. (2) The temple (in Jeremiah's day) was so far gone and the people we so dependent upon it in false dependence, that it would be judged. Jesus was, I think, also confronting the religious leaders of his day. Consider how both Isaiah 56:10-11 and Jeremiah 7, is a rebuke on the false leaders who were leading the people astray. In this respect, I agree with N.T. Wright in his Jesus and the Victory of God, Jesus was like the prophets of the Old Testament who was enacting something symbolically. Jesus was not cleansing the temple as a fix of what was wrong, Jesus was prophesying the destruction of the temple. "Cleansing [the Temple] is not enough; what is required is destruction -- not simply because a new Temple must be built, but because the present one is utterly corrupt." (Wright, Jesus and the Victory of God, p.419). (2) Jesus saw himself as the one ministering the deliverance the downtrodden needed just as YHWH said he would do. Consider this, immediately after overturning the money changers, we read "14 And the blind and the lame came to Him in the temple, and He healed them." This is not a free floating act unconnected to the symbolism of what Jesus has just done. Jesus is doing something like what Isaiah 56:8 speaks of "The Lord GOD, who gathers the dispersed of Israel, declares, "Yet others I will gather to them, to those already gathered.” He is gather the lowly and needy. Those excluded from the courts of the temple because of ceremonial uncleanliness, like the eunuchs in Isaiah, were now cleansed and restored. Jesus is offering a more powerful salvation than the Temple offered. It may hint at his replacing the Temple. Jesus, not the Temple, is the one around whom the eschatological people of God will gather around. This puts those loyal to the temple on the wrong side of the work of God. Jesus' quote of Psalm 8:2 in response to the leaders' indignation makes this clear. Thus, Jesus doesn't cleanse the temple, he symbolically enacts it's destruction. This destruction was fulfilled in AD70 by the Romans.